With the Rover centenary and women’s month in full swing we continue to profile our women in Rovering. Twenty three year old Nikiwe Mthisi is a Rover in Mataffin, Mpumalanga. Nikiwe studies IT and user computing and wants to be a teacher once she has completed her studies. She loves Scouting, reading, singing and meeting up with her friends. 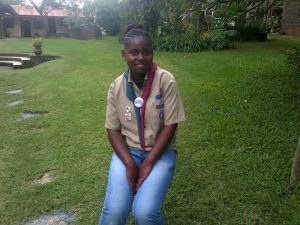 “I joined the Scouting Movement in 2002. I was so shy and there were so many people that I felt uncomfortable at first. 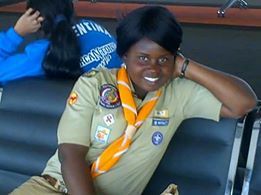 But, Scouting had made such an impression on me that I came back in 2003”, Nikiwe tell us with a smile. “I stayed in the Movement and became a Rover five years ago. Scouting took me away from many things and it helped and motivated me as a person. Rovering continues to show me things I would have never done before, I have met new people and it is easy to have family and friends in Rovering”, she explains. “Rovering builds up your confidence and self-esteem. It teaches me to be independent, to be a leader and to communicate. It gives me the chance to stand in front of young people, to share information with them and to help them to have a better future. It also prepares me to become a teacher”, Nikiwe says. Some of the best experiences she has had with the Rovers are travelling, going on camps and doing hikes without giving up – even on long distances. “I always enjoyed being part of the group in Scouting, but I was rather in the background. When I became a Rover everything changed because I had to become a leader”, she says. “I learned to be independent. After Matric I had no support in fulfilling my dream of becoming a teacher. In Rovering I had to do something on my own but I had the support of other Rovers. Without Rovering I would be at home or I would do a job which needs no qualification. Because of Scouting I could attend Saturday and holiday classes”, Nikiwe adds. “In 100 years from now I would like Rovers to remember that it is important to help others and to make sure that people next to you benefit from what you have, too. They should remember to try and make as much community service happen as possible. They must also remember not to let their Crews die and to keep them functioning”, Nikiwe concludes.